A friend of mine recently had a baby girl, and I thought a unicorn amigurumi would make a great baby shower gift! There is something so special about giving a one-of-a-kind gift that no one else will have. Meet your new BFF, Jazzy. She's as magical as she is cuddly, and her wild colorful mane gives her a ton of personality! Stuff the head ¾ full. Decide on where you'd like to place the eyes and sew between those two spots to create indents for the eyes (see Notes section at the bottom of the pattern for more detailed instructions). Insert eyes your safety eyes and secure the backings. Ummm I don’t crochet but I love this and can’t wait to rope my MIL into making this with my daughter! 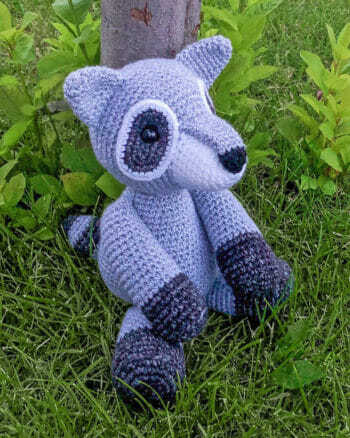 I’ve never crocheted an amigurumi but, all my friends at A Stitch In Time are so I going to give it a try. Wish me luck. I love this <3 but I've just started and I'm confused.. The head: going from line 8 to 9, you loose 12 stitches (from 42 to 30) but I only count -6 stitches = 36. 09. sc 2, dec [-1], *sc 4, dec* 5 times [-5], sc 2 . I’m just starting your pattern, what does it mean to sew between the eyes? Thank you for a super cute pattern! If you look at photos of my amigurumi, all of the eyes are slightly indented. I accomplish this by “sculpting” the head. Before I insert the safety eyes, I mark the holes where I will insert them (I prefer using a disappearing ink pen, but a regular marker will do since it will be covered later by the eyes). 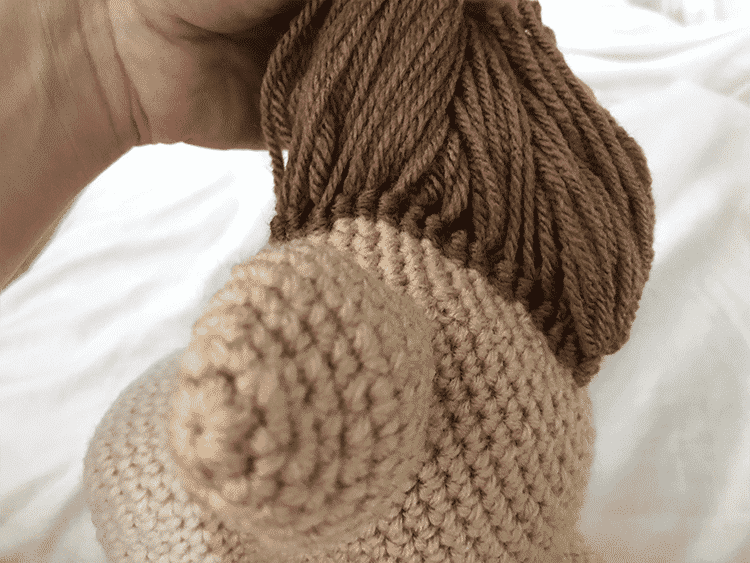 Then I cut a length of yarn that matches the head, making a large knot in one end, and threading the other end through the eye of a yarn needle. We’ll start with the right eye. Put your hand up inside the head, and insert the needle from inside to outside, in the hole immediately to the right of where you’ll be placing the right safety eye. There is now a strand of yarn coming out of the head, secured to the inside of the head with a knot. Next, insert your needle from the outside of the head to the inside, two hole spaces to the left (through the hole immediately left of where you’ll be placing the right safety eye), and exit the needle on the opposite side of the face, through the hole to the right of where you will be placing the left safety eye. 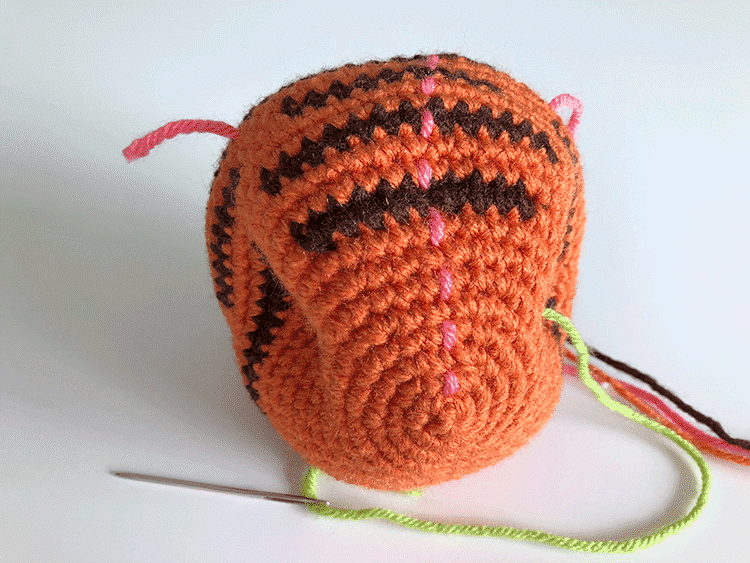 On the right side of the face, you should now have a horizontal “stitch” of yarn the length of 3 hole spaces (the center hole covered by this stitch is where you will be placing the right safety eye), and a length of yarn with the needle on the end should be extending from the left eye area. Now insert your needle into the hole immediately to the left of where you will be placing the left safety eye, and exit the needle on the right side of the face, through the hole we first started with (the hole to the right of where we will be placing the right safety eye). 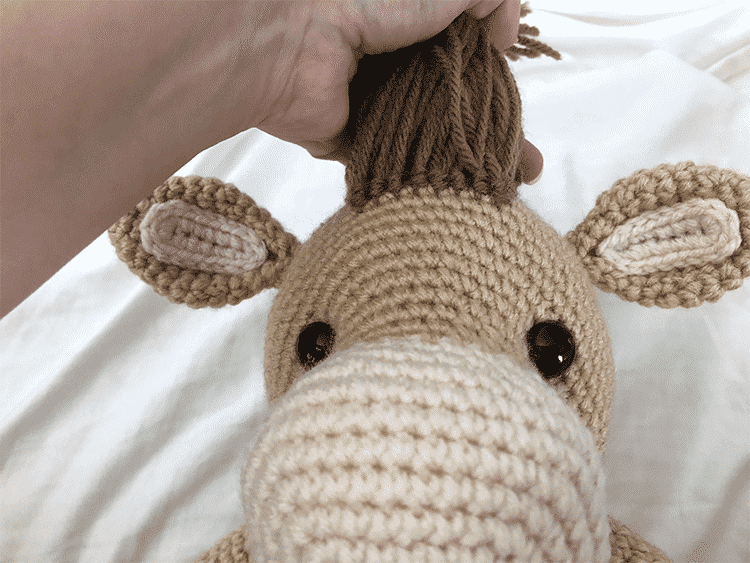 You should now have a horizontal “stitch” of yarn extending the length of 3 holes on both sides of the face (you will eventually be inserting the safety eyes in the hole at the center of both these “stitches”), with a strand of yarn extending from the right eye space. Pull your yarn strand taught, which should create indents where both eyes will be placed, and stitch through the same holes in the same order once more to make everything more secure. 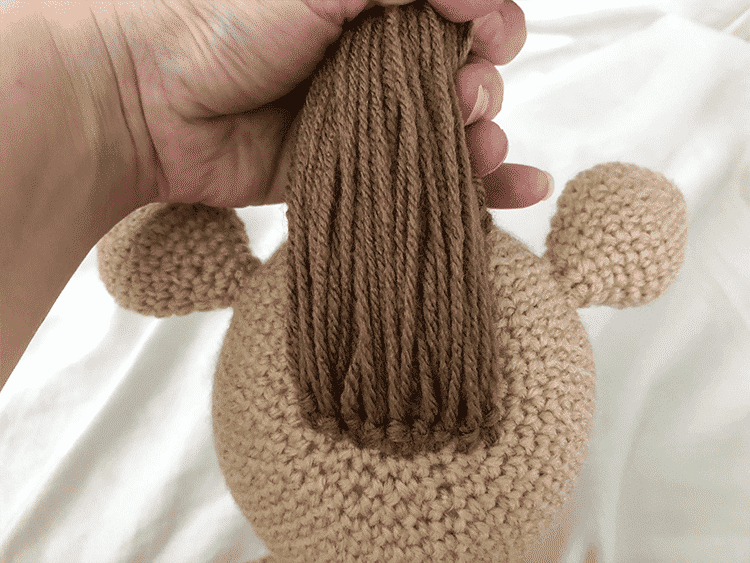 End by inserting your needle back inside the head and secure the tight tension with a knot that is anchored inside the head and snip the tail. You should now have eye indents! Then you can insert your safety eyes as normal and secure the backings. The safety eyes will completely cover those horizontal yarn “stitches”. Thank you so much for posting this pattern, actually for sharing your gift in general :-). I am currently making this for a baby shower, but am still a bit unsure about the eye indents. Do you happen to have a video for this? Hi Maddi, thank you for the kind words! 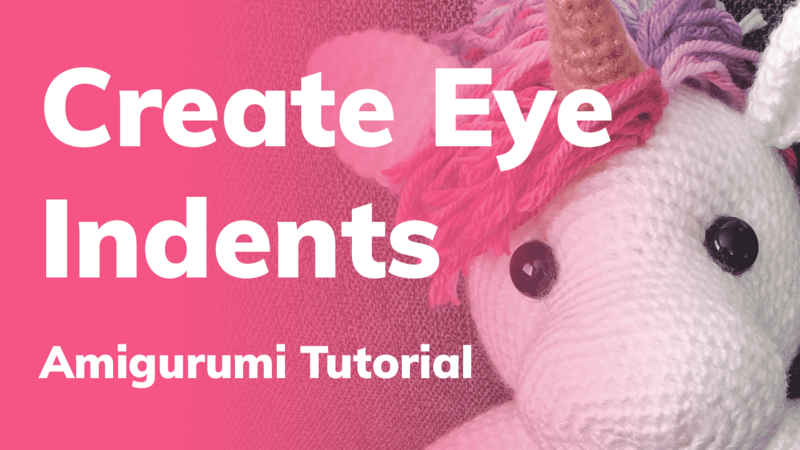 Unfortunately I don’t have a video tutorial for the eye indents yet, but I do plan to make one in the near future (I haven’t been able to find a video tutorial by anyone else either!). How did you do the mane and tail? I found Caron Simply Soft in Autumn Maze. It has a nice sheen and works very well for a horn. 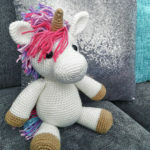 Hi Jess, I adore this little unicorn and want to make one for my stepdaughter as well as my granddaughter, I noticed there is no yardage. Is one skein of the white more than enough? Thank you so much and I cannot wait to see your giraffe! Hi Danielle, thank you for the kind words! I’m working on totaling the yardage for each of my patterns today and will update them with that information. 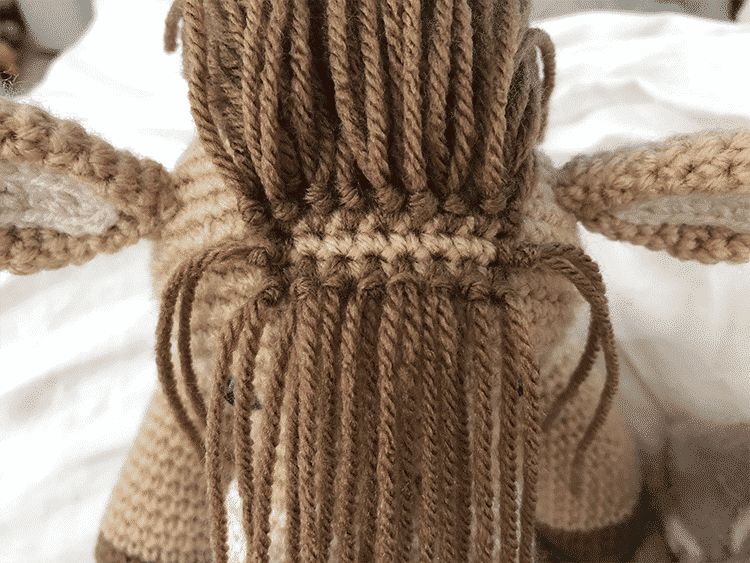 At 14” the unicorns are quite big, so you will only get 1 per skein. As a rough estimate, I’d say you’ll need ~275 yards of white per unicorn and a skein of Caron Simply Soft has 315 yards. I hope that helps! Fantastic! Thank you so much for the speedy reply! 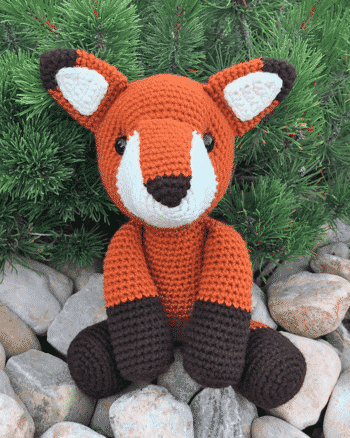 Can I sell the animals I make from your free patterns? Hi! 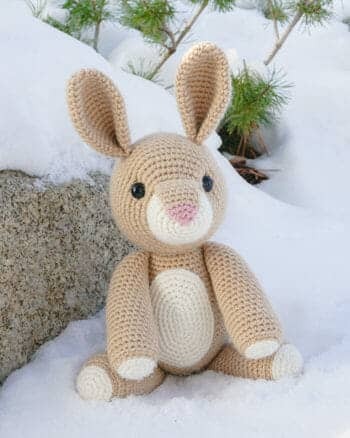 I’m new at making amigurumis and I’m kind of confused i don’t understand the first step at the head only could you explain me in some easy way please! 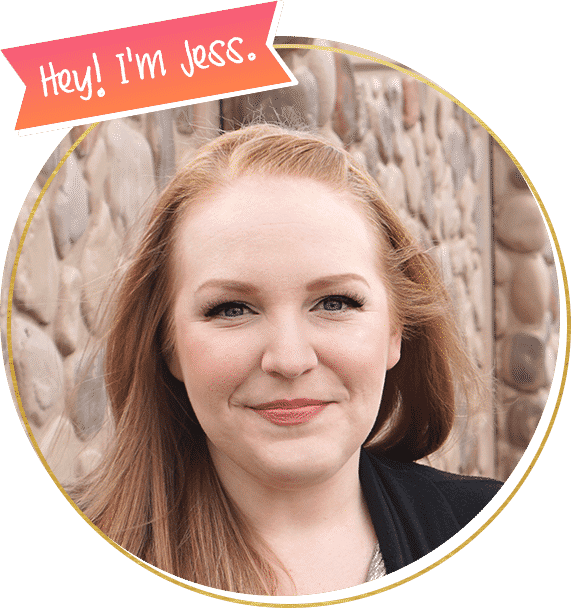 Hi Jess, I just wanted to let you know that I just finished this pattern yesterday. It’s definitely different from the other unicorn patterns I’ve done. I ended up doing the mane in the chakra colors and used a spiral for the tail. I also made a scarf in the chakra colors, excellent job on the pattern!!! Hello! Im confused about line 8 of the head, i count less than 48. can u help me please? Hi Ale, round 8 should end with 42 stitches. 🙂 I think you may have been looking at the line above by mistake? If you still need help, please let me know! sorry I wanted to say, line 8 does not add up 42, the instruction Is correct? It is the equivalent of *sc 6, dec* (a total of 7 stitches) repeated 6 times, and 7×6=42. On even-numbered rounds, I take the first set of stitches before the first decrease and split them, moving one half to the end of the round. This results in a more perfectly-round piece. I hope this helps! 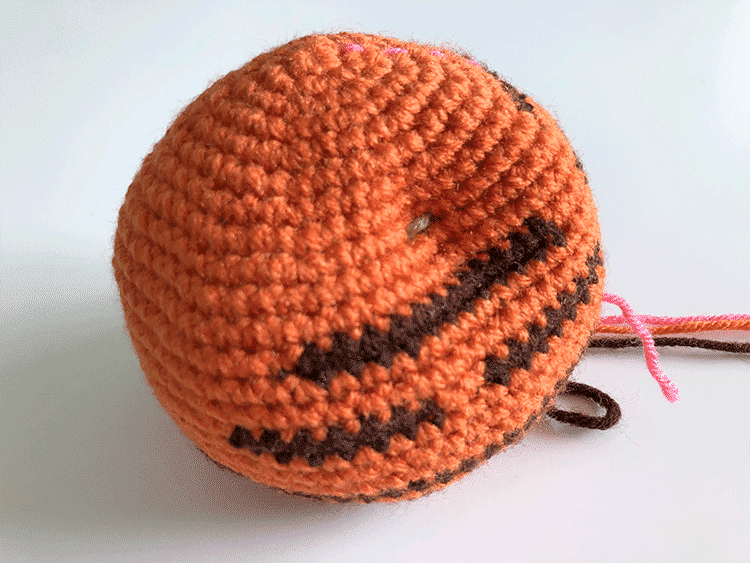 If your count is still off, try frogging round 8 and counting your stitches in round 7 to make sure there are 48, then proceed again with round 8. Sorry it was my mistake. Thank u forma everything Xoxo. On rows like 9,14,15, do you repeat that all the way around? Or just do it once and move on to the next row. Also what do the asterisks mean? Love the pattern, first amigurumi, but it’s going well!! If you’re not already, I highly recommend using a stitch marker so you can easily keep track of the beginning/end of your rounds. That way you know when to stop when you’re repeating a sequence all the way around. I hope that makes sense! Hi Melanie, “inc” (increase) means do two single crochets in one stitch. Hi! I made this unicorn and it turned out PERFECT! Is there any way to make a mini version of this? Maybe this exact latter just cut in half? I really want to make a set of 3 mini ones of these for a friend! I love this pattern but have just one question. In some of ur lines u have mentioned that 3sc dec *6sc dec*5 times and then 3sc. I was wondering. Why u don’t just make it as 6sc dec all around as it works up to the same count of stitches.